Considering the amount of paperwork individuals receive in their lifetime, it can be overwhelming to figure out the best way to manage so much information. Do you need to keep every piece of data that you receive? What can you simply throw away, and which documents should be properly destroyed before their disposal? A document that does not contain any sort of personally identifiable information can typically be thrown out. Otherwise, it is important to decide whether or not you may need that record in the future. Some records should be retained anywhere from just a few days to over ten years, depending on the information that is contained in the document. So which documents should you keep, why might you need them in the future, and how long do you need to have them on hand? The following chart helps to provide some guidelines when it comes to how long you should keep your records. Find a more detailed list of record types and retention times here. As you go through your records you might find that you need to keep a large amount of files. If the amount of files you need to keep is piling up, you might look into offsite storage services to help store and organize your documents. Offsite storage facilities keep your documents protected and organized, and they offer retrieval and document shredding services so you can keep your inventory up-to-date and secure. Offsite storage reduces the costs associated with storing documents in the office, and you get to tidy up and create more open space. New laws and guidelines are continually arising regarding the retention and disposal of records containing personally identifiable information. 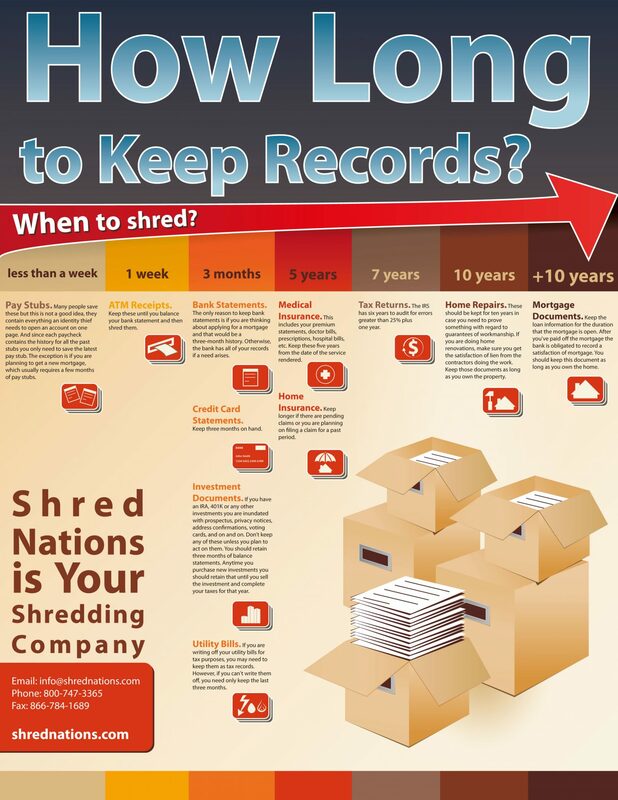 If you are still unsure whether or not it is necessary to keep specific records or have any other questions, Shred Nations is here to help. Simply fill out the form on the right-hand side of this screen, or give us a call at (800) 747-3365. Our experts are prepared to answer any of your questions and will help you decide on the best shredding and/or storage options based on your needs.